The plan for this card started hatching as soon as I saw this gorgeous bundle in the new Holiday Catalogue (runs from 1 September 2017 to 2 January 2018). 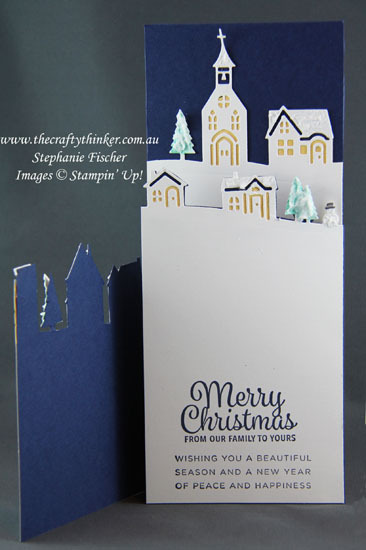 Contact me if you would like a Catalogue (and live in Australia and don't have a Stampin' Up Demonstrator). The bundle comprises the Hometown Greetings Edgelits dies and the Hearts Come Home stamp set to provide a saving of 10%. I made a trifold with an A4 piece of Night of Navy cardstock cut to 10.5" long. I scored the long side at 3.5" and 7" and folded in the right side and then folded over the left side. 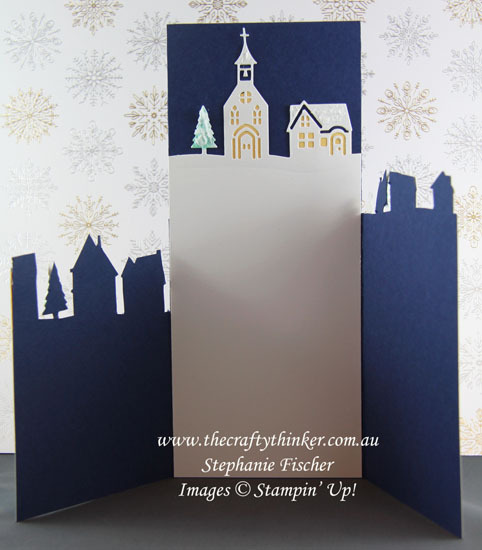 I then made Whisper White layers cut with the three "hometown" dies in the set. Before I adhered the die cut layers to the base card, I glued pieces of So Saffron cardstock behind the buildings to light up the windows. I then cut down the two folds as far as the die cuts and fussy cut around the shapes. I coloured the trees roughly with some Emerald Envy ink and then gave them a layer of Embossing Paste snow. I also added some Embossing paste to the roofs.